What is Southwestern Pennsylvania Sustainable Business Compact? Sustainability is fast becoming a business priority in the Pittsburgh region. The Southwestern Pennsylvania Sustainable Business Compact provides a rigorous, peer-reviewed framework for businesses to advance and publicly demonstrate their corporate sustainability achievements.The Southwestern Pennsylvania Sustainable Business Compact enables the region’s businesses to voluntarily engage in sustainability practices that simultaneously advance their economic and governance performance, the environment, and the social fabric of their communities. Businesses that incorporate sustainable practices into their operations and commit to a regional sustainability orientation stand out as valuable contributors to Southwestern Pennsylvania’s sustainable development. As more businesses apply sustainability in their operations and community responsibility, the cumulative benefits produce more business success and, in turn, a stronger region poised to thrive and continue its legacy of innovation. 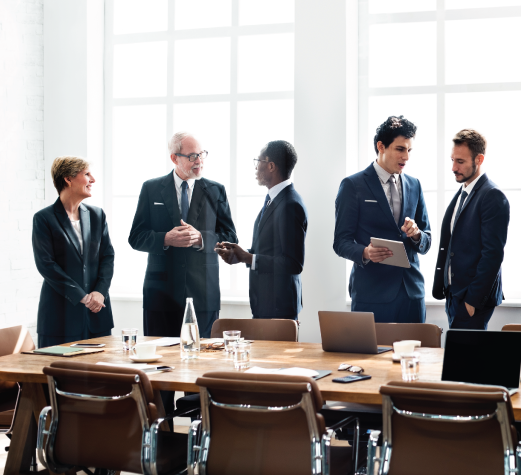 Sustainability reporting enables businesses to better understand the link between their sustainability management practices and their long-term financial performance. It is a tool for setting goals, managing progress, communicating impacts to key stakeholders, and gaining recognition. According to the G&A Institute, 82 percent of the S&P 500 published a sustainability report in 2016. What is involved with joining the Compact? 1. Self-Assessment: By reviewing the Performance Criteria, a company can self-assess its sustainability performance. 2. Substantiation: To support its self-assessment, the company provides substantiation (required only at the Gold and Platinum levels). 3. Materiality Assessment (required only for Platinum-level achievement): In financial reporting, materiality is the threshold beyond which missing or incorrect information is considered to have consequences for decision-making. Materiality for sustainability reporting is broader, reflecting the business’ significant economic, environmental, and social impacts. These factors often have significant financial impacts for the organization in the short or long term. How can my business benefit from issuing a Compact? For the business taking its first steps in sustainability, the Compact On Ramp offers a baseline for implementing policies and initiatives, tracking performance and making improvements. The Compact provides guidelines for reporting on sustainability, helping the company to respond to stakeholders and stand out among competitors. Some will use the Compact to position for reporting to the Global Reporting Initiative or B Impact Assessment and respond to impact assessments from the CDP (formerly the Carbon Disclosure Project), RobecoSAM/Dow Jones Sustainability Index, and others. 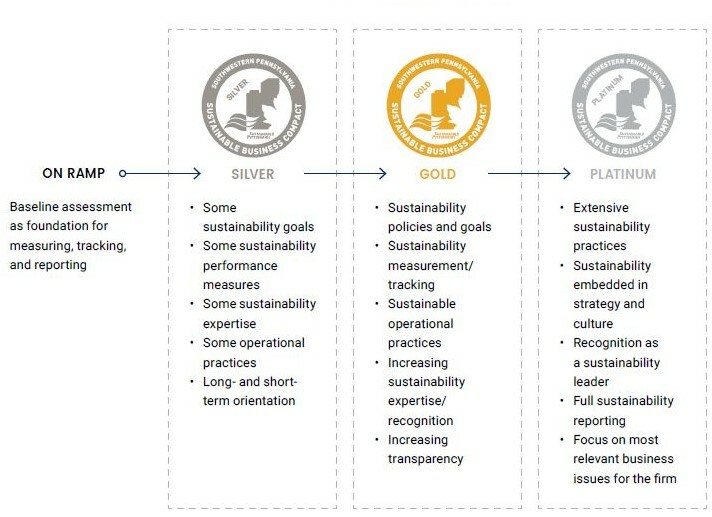 For the business that has embedded sustainability fully into its operations, culture and strategy, achieving Silver-, Gold-, or Platinum-level standing in the Compact is a means of receiving regional recognition for its sustainability disclosure and performance, as well as of incorporating sustainability issues of regional importance. Download Performance Criteria at the link above to access the full Compact guidelines, including the Compact On Ramp. Through the On Ramp, businesses can assess their sustainability performance, commit to progress, and follow a roadmap to Compact achievement. The Compact On Ramp is also the first step for businesses interested in participating in the CEOs for Sustainability executive council. Learn more at CEOsforSustainability.org. In addition, On Ramp data is tracked in aggregate to assess business sustainability progress in Southwestern Pennsylvania. Getting started with the On Ramp is easy. Simply download the On Ramp survey and submit your completed response to compact@sustainablepittsburgh.org. The process typically takes just a few minutes. Sustainable businesses have a competitive advantage and build a vibrant region.